These scribblings are a flight log follow up to my February construction notes on an attempt at a novice style pylon duration model which is capable of being flown in a small field typical of Ferry Meadows. On an average day, this is a 45sec field unless you want to go paddling, tree climbing or fighting cows for return of your creation. A broken airplane on the first flight. 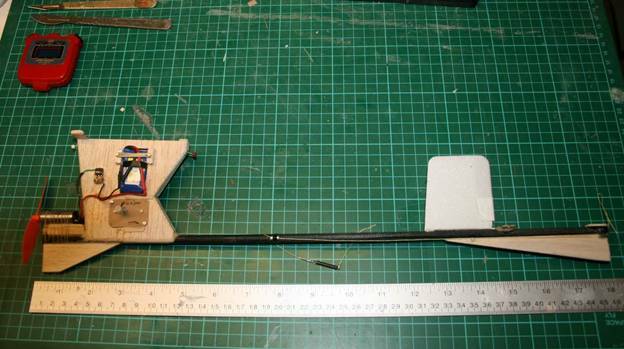 Several rebuilds replaced the balsa fuselage with part of a Poundland fishing rod. Alas, bare fuselage weight rose from 3.5gm to 7gm. Underfin added to stablise the model in yaw. Under belly propeller skid to keep it in one piece for more than 2 flights. Replaced the balsa fin with Depron to annoy Moley. The trim is pure DixieLander, 2 degs left motor thrust, 2 degs down thrust, 10mm wash in wedge on right inner, very small left rudder. The model climbs right rotating ACW. Glide is left via tail tilt. Transition is faultless with no height loss. This was luck. Following a troublesome start, the climb over 8 flights thus far, is very stable. CG came out at 55mm from LE. 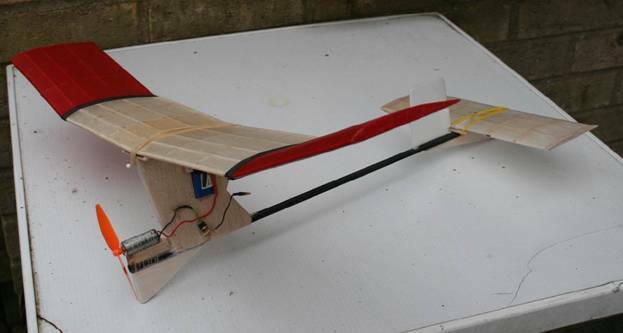 On an 8 sec motor run, the model gets to 100-120 feet (estimated) and offers 35-45s duration. 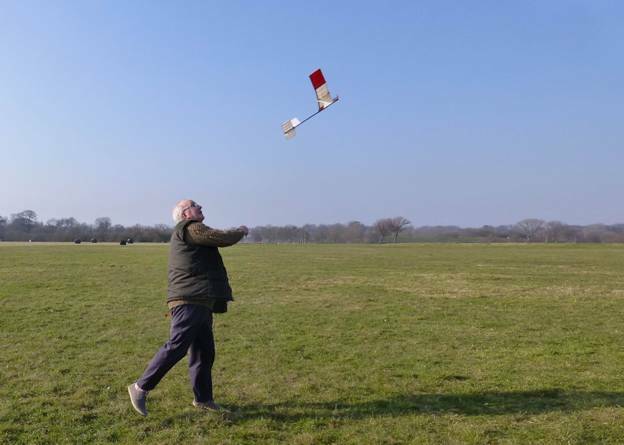 The last flight on Tuesday was 2m 15s and remained in field as the windspeed was a paltry 2 mph. This prompted me to retrofit a DT, a Tomy waggler. With repairs and additions the weight has crept up from 55ms to 64.5gm. A new lighter weight fuselage is on the 'do list'. The model climbs not far off SLOP performance without the fuss and is a delight to fly. If you want an easy in on pylon duration at Ferry or similar small field, then this is for you ! This picture shows a typical launch, courtesy of Mick 'Butterfly' Page. The fuselage with Tomy DT now looks like this. If you want to build one, then the Imperial ruler will give you the key dimensions. Decalage is stab 0 degs , pylon 3 degs. Build time about a mornings worth. All the other dimensions can be found in the previous article. The brushless motor variant was not a success. A few pile ins and motor shaft was bent. Use the GWS 12mm can motor a GWS 3 x 3 propeller and a 250mah 2s Hyperion Lipo. But use what is in the scrap box. Recommendations for power unit are :- GWS 12mm can motor running a GWS 3 x 3 propeller and a 250mah 2s LiPo. Other systems are OK but avoid brushless, it is all too easy to bend the shaft on pile in. Turn up with a KP01 on pencil sharpener power and you will be blown into the weeds! I await Ted's full Depron model with interest but point out that he has yet to build a 60gm model and he must avoid 'beefing up'. If any members wish to build a model of this type I will be too happy to CD an informal electric competition on Peter Gibbons Ferry competition days, subject to his agreement.